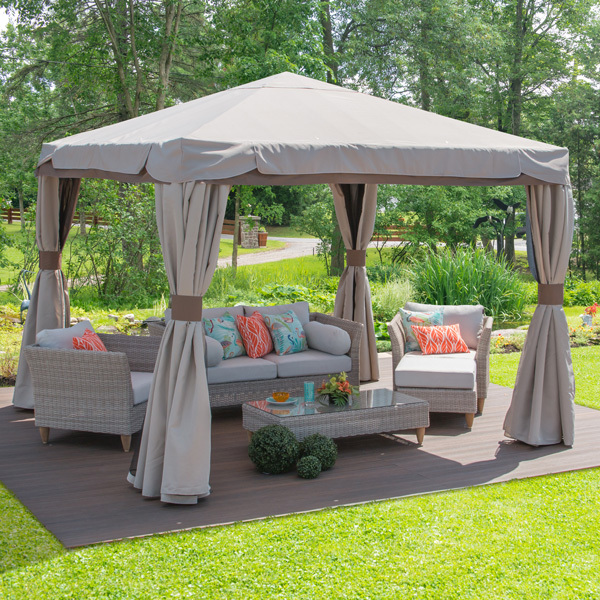 Gazebos create the perfect outdoor area for al fresco entertaining. They offer protection from hot sunshine and unexpected drizzle, which means that whatever event you have going on, it can freely continue regardless of the weather. Besides being quick and straightforward to set up, thanks to their handy pop up mechanism, they are also very handy for a wide range of events and applications, which makes them a great investment for your backyard. You can turn your gazebo into a Zen zone and use it for meditating, yoga, reading a book or enjoying a bit of peace and quiet away from your busy home. You can place a freestanding hammock under it to create a cool area for unwinding or place an inflatable hot tub to create your own spa experience in the comfort of your backyard. But how do you know which one to choose? Here are some considerations to keep in mind. When choosing a gazebo, size is probably the most important thing to consider. Keep in mind the number of people that will use the gazebo, and choose accordingly. You should be comfortable and not feel crowded under it, in other words, it should be big enough to shelter you from the elements. You may be tempted to choose the biggest gazebo you’ll come across, but don’t forget the size of your outdoor space. Measure the area where you are planning to place the gazebo and ensure there is enough room to navigate through the rest of the yard. If you usually do intimate gatherings with just a couple of people, a smaller gazebo, such as a 2×2 m model will be enough. However, if you plan to use the gazebo for bigger events or like having a big and airy space, you may want to consider a 3x4m or a 3x6m model. Nowadays, gazebos come in different designs and colours in order to suit different kinds of events and personal styles. Before buying, consider whether you want your gazebo to blend in with the greenery of your garden or really stand out. Choose brighter colours if you want to create a fun and more laid-back atmosphere. On the other hand, neutral colours will make for a more elegant and timeless look. Gazebos often come with pop up mechanisms to ensure that the assembly process is as smooth and easy as possible. All you need to do to assemble a gazebo is just walk out the frame, place the canopy on top, and extend the legs. Remember that a larger gazebo will have a bigger frame and side walls, which means you may need the help of a couple of friends to put it up and take it down.